If you don't follow my posts on a regular basis you may not have come across my dreams & plans list which I created at the beginning of this year. 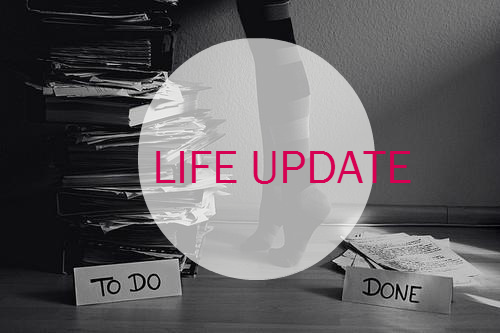 I thought it was about time that I provided you all with a 'life update'. Okay, so not much has happened in terms of completing the list... yes yes I am working on it. However, I don't know if you saw my recent tweets or career change blog post, but I have moved jobs! WOOP!! It's a big deal for me and I am once again moving my way up the career ladder. I am now working for the amazing company that is The Chartered Institute of Marketing which is HUGE! Especially in my line of work. As a marketer, to work for a company that represents the meaning of marketing is incredible. So I can officially cross that off my Dreams & Plans list. Now I have secured my new position here at CIM, I can now start to focus on progressing within my role and build on my knowledge. It's EXCITING! (I have said exciting about 50 times this week alone). I can also concentrate on saving now which will be amazing. There are so many benefits working for such a great company, but one of the little extras that's thrown in is the luxury of having a gym. I have been wanting to get back into shape and lead a more healthier lifestyle, which I have started and stopped so frequently. Now, I have no excuse! Bring on the bikini bod. Another bullet point on my to-do list was that I wanted to attend London Fashion Week this year. Unfortunately, I didn't get the chance to attend LFW because I couldn't get the time off work. BUT, I was able to get tickets for London Fashion Weekend in February which was okay... I don't know if you saw my posts around the shows, but I didn't have the best time to be honest. However, I did go so that was one of my to-do's that I can firmly scribble off my list. You all know how eager I have been to book a holiday, I have finally planned a break away with my sister and little brother. It will be out first family holiday abroad which is crazy! I cannot wait. We have decided a last minute deal would be best so we can work it around all of our schedules. So YES I can cross that off too. So, as you can see there is still a long way to go until I complete my list, but like everything.. it's a work in progress.